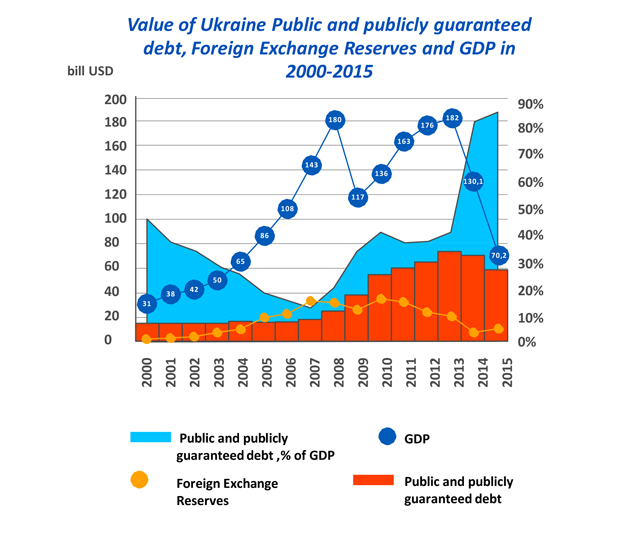 In 1999 Ukrainian government debt exceed critically level of 60% of Gross Domestic Product (GDP) : $15.3 Bn. In 2002 ,Ukraine refused credits from IMF. From the end of 2004 cooperation with international finance institutions was limited by consulting and technical support. New credit programs were not taken until 2008. In 2004, world leading rating agencies raised Ukraine’s credit rating to “B -”B+” with stable and positive forecast. Itgave the government access to international finance markets and placing Eurobonds of Ukraine by record low rates, 6,9%. The result was in reducing debt pressure on Ukrainian economy. The acceleration of the global financial crisis in 2008 caused the “stop effect” for Ukrainian economy – massive private capital-output from Ukrainian market, reducing both domestic and external demand for Ukrainian products. 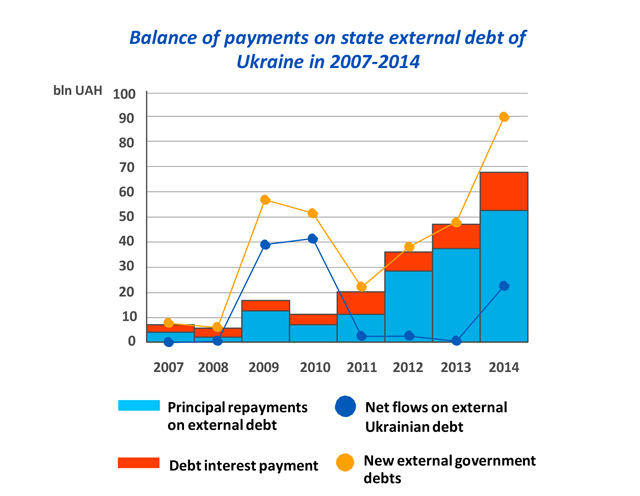 Ukraine again started to accumulate debts. 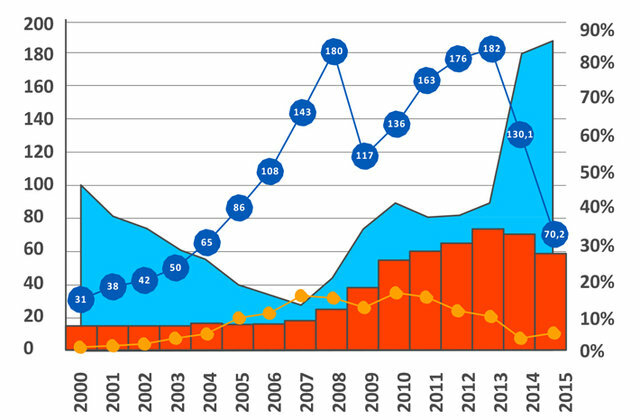 Accumulated new debts in 2009-2010 years in 2011 led to a threatening situation. New external debts were almost equal repayments on previous loans. In this situation, Ukraine made a radical turn in economic policy, including the financial economic sphere, after the regime change after the tragic events of winter 2014. 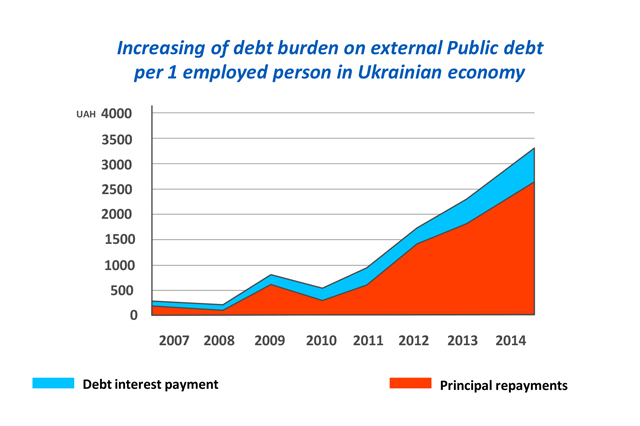 2015: Public and publicly guaranteed debt will increase to UAH 1.394 trillion and will exceed Ukrainian GDP. In March 2015, Ukraine received the first $5 bln tranche due to new IMF credit program « Extended Fund Facility », with overall financing of $17,5 bln. De-facto fulfillment of credit terms would mean loss of Ukrainian independence in economic policy.